Jan 7 <>, Orchidaceae Will Continue!! I have some GREAT news. A subscriber and an orchid enthusiast, Melissa Moravec, has agreed to take over the Orchids-Plus-More web site. She has 25 years of experience in growing orchids and a love of orchids. It was wonderful to get to know her over the past days and to share her enthusiasm of orchids. I know that she will do a wonderful job and bring fresh ideas to the site. By the way, Melissa has another interest - she is a vintner or winemaker. She has done this commercially as well as having her own vineyard in California. I want to thank you a lot of you for your words of appreciation you sent to me. Thank you again for all your interest in orchids and your support over the years. 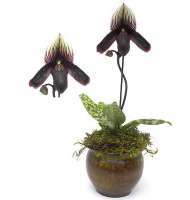 A paph is also called a "lady slipper".